In a recent study of Arizona women, pharmacists were reported to be a trusted source of information and to have the ability to impact behavior. Women reported that they are comfortable asking questions of their pharmacists and that they sought a pharmacist's advice on health issues including the importance of multivitamins. The Arizona Pharmacy Association and the Arizona Department of Health Services have formed a partnership to help educate women of childbearing age on the importance of taking a daily multivitamin with 400 mcg of folic acid. You can help with this education in your daily practice by alerting women to an Arizona Department of Health website where they can learn important health information and register to receive a free 100-day supply of multivitamins with 400 mcg of folic acid. Here is a picture of what they will receive when they register for the multivitamins. 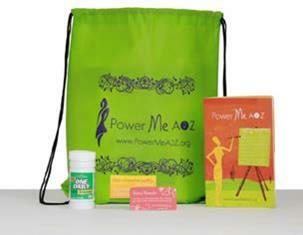 The www.powermea2z.org website is an age-appropriate, fun and interactive website for women ages 18-26. All you have to say is, "I recently learned of a website called powermea2z.org that you might be interested in visiting because they are providing women your age with free multivitamins and other important health information." If you would like additional collateral material to distribute at your store, please contact Melanie Susswein or visit the Contact Us section of the www.powermea2z.org website. Health insurance is every practice's nightmare. I'm sure you have millions of questions that arise when you're pulling and filing claims. Don't fret, though, you're not the only one who's confused. Most of your patients do not know about their insurance either, and it's up to you to educate them. USA Today recently reported that about 7 million Americans are estimated to start buying health insurance as part of the new law, but a new survey showed they don't understand the basics of how insurance works or is provided. Industry pulse: Do you teach your patients about insurance? Tivicay has been approved by the FDA to treat infection with HIV-1, a strain of the virus that causes AIDS. The drug, among a class called integrase strand transfer inhibitors, interferes with an enzyme that HIV needs to multiply. It's been approved in combination with other antiretroviral drugs and for people aged 12 and older who weigh at least 88 pounds, the FDA said in a news release. Looking for similar articles? Search here, keyword AIDS. Compounded sterile products can be prepared within the health-system pharmacy or prepared by an external compounding pharmacy for the health system. Since the events of this past fall related to tainted compounded products given to patients, many healthcare systems are considering bringing the preparation of CSPs in-house. Pharmacy Practice News editors answer some questions about what that process entails, offering tips to help facilities determine whether a switch to insourcing makes sense. With the Oct. 1, open enrollment start date fast approaching, pharmacists can expect to have questions from their patients about how to use the health insurance exchanges — now being referred to by CMS as a health insurance marketplace. Included is a handout that can be printed to better explain the health insurance marketplace. The primary ethical obligation of a pharmacist is to avoid harm by filling each prescription correctly. For this reason, pharmacies, pharmacy organizations and boards of pharmacy have adopted and espoused the principles of continuous quality improvement. T. Mark Jones learned about the costs and benefits of healthcare delivery when he treated AIDS patients in Key West, Fla., in the late 1980s. The pharmacy he co-founded provided a humane last step for gay men who didn't want to spend their final weeks confined to a hospital. Jones, a registered nurse, went into homes to dispense infusion-therapy drugs and teach patients to care for themselves. His dream job began to unravel in 1991, when a national healthcare chain came to Key West to open an AIDS clinic. Polypharmacy and inappropriate prescribing of medications are an increasing problem in elderly adults. Drug-related admissions for people aged 65 to 84 increased by 96 percent from 1997 to 2008, and nearly half of adverse drug event-related hospitalizations occur in adults aged 80 and older. Inappropriate medications in elderly adults can lead to confusion, falls, cognitive impairment, poor health status and mortality. University of Sydney researcher Dr. Wojciech Chrzanowski has gained international attention for his groundbreaking work on biomaterial technologies, an area that seeks to enhance the integration between human cells and surgical implants. Evidence has shown antimicrobial stewardship programs to be effective in reducing inappropriate antibiotic prescriptions among inpatients, and new research suggests that similar programs may also decrease the amount of antibiotic prescriptions among outpatients with common respiratory infections who receive the majority of antibiotics. The FDA recently announced that fluoroquinolone antibiotics taken orally or by injection pose the risk for permanent peripheral neuropathy, a risk that will appear on updated labels for the drugs. A bluntly worded American Medical Association resolution that was intended to curb a barrage of retail pharmacy phone calls to physicians requesting additional information about pain medication prescriptions has triggered a backlash from pharmacists. The FDA recently announced that fluoroquinolone antibiotics taken orally or by injection pose the risk for permanent peripheral neuropathy, a risk that will appear on updated labels for the drugs. There are six FDA-approved fluoroquinolone drugs on the market: ciprofloxacin, gemifloxacin, levofloxacin, moxifloxacin, norfloxacin and ofloxacin. More than 10 percent of visits to primary care physicians are related to back or neck pain, and the results of a new study suggest that these visits increasingly result in unnecessary prescriptions for narcotics, despite the publication of new clinical treatment guidelines recommending first-line treatment for back pain with NSAIDs or acetaminophen. Risk evaluation and mitigation strategy programs have generally existed outside of normal healthcare delivery systems, but it's time to merge the two, say pharmacists and other healthcare provider. The FDA recently repeated its warning about sterile products made by a Texas compounding pharmacy because the business is refusing to abide by the agency's request for a recall. The business is Dallas-based NuVision Pharmacy, according to the Tennessee Department of Health website. The FDA previously issued an alert about the company's products May 18.